Last night was our first formal dinner party since the New Year and I wanted to add a little wow factor to the end of the meal. 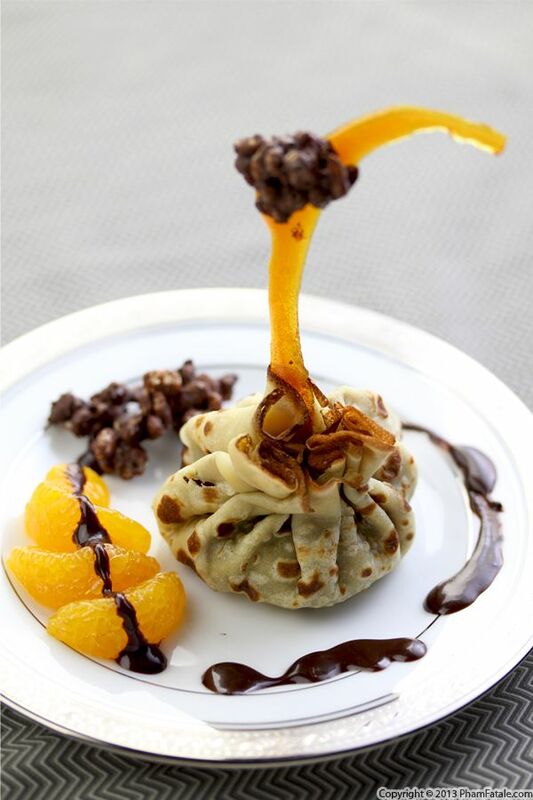 I prepared a mandarin-flavored dark chocolate mousse and enclosed it in the cutest little crêpe purses. The decadence didn’t stop there, as I garnished the purses with chocolate puffed rice "hung" up high on a spun sugar stick. A little drizzle of coffee-liqueur chocolate sauce finished off the dessert and guaranteed that it would satisfy even the biggest chocoholic's cravings. I'm starting to plan out what could amaze my Valentine in a few weeks and I know for sure my husband Lulu would be more than delighted that we end our Valentine's Day romantic dinner feeding each other chocolate! Check back for more ideas. Halloween is a few days away and I've been preparing little sweet treats in anticipation of the event. For breakfast, I baked bat-shaped chocolate wafers that I paired with sweetened yogurt and fresh figs from our garden. 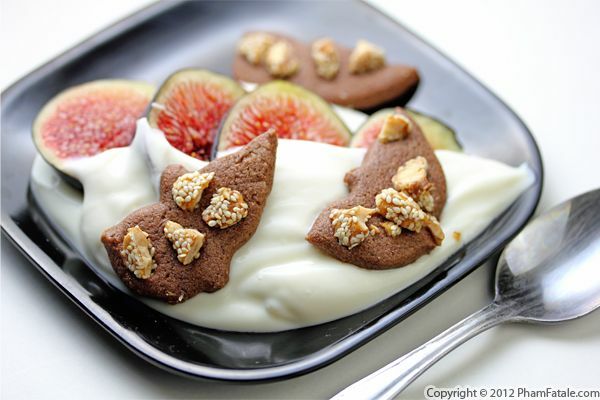 The result is divine; the crunch from the cookies balances out the smooth texture of the yogurt, and chocolate and figs work beautifully together. I'm going to be baking a lot more scary-looking pastries until Halloween, including my witch's fingers, funny-looking sunny side up eggs and ghost-shaped pancakes. If you have other suggestions, feel free to send me a message! Today, I felt an urge to make chocolate pudding. By itself it can be a bit boring, so I spiced it up with cardamom and carrots. The idea is to obtain a gooey melted center with crackly edges. I love the contrast of hot and cold, so I paired the baked dessert with Indian cardamom ice cream I bought at a local Indian store. I made the dessert in individual ramekins, which can help with portion control (assuming you stop at just one). This dessert might be a little high in calories, but what’s life without a little decadence? You won't be able to resist! 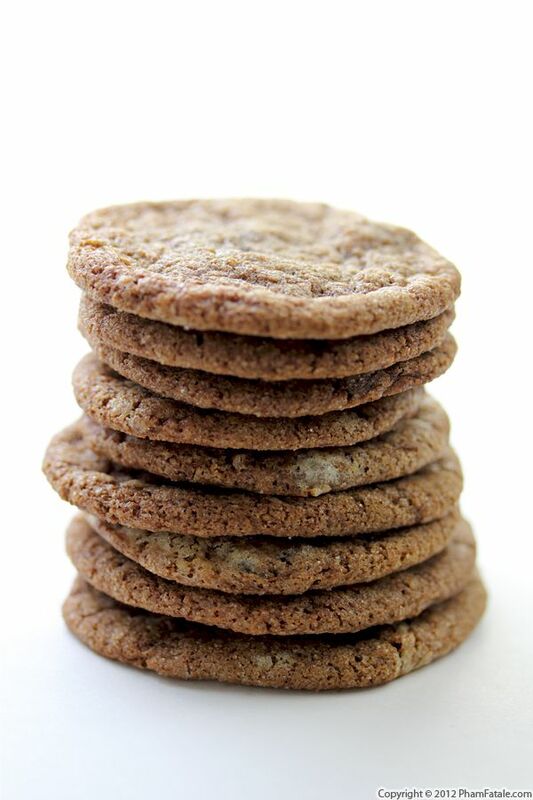 If you love chocolate and hazelnuts, you're going to love these cookies I just created. Sunny, my husband's oldest sister (she's 16 now), promised her girlfriends she would bring some sweet treats to share with them at school, so I helped her out by making these decadent French-inspired cookies. Nutella serves as the base of the cookies, to which I added a layer of homemade hazelnut cream (frangipane-style) and a smattering of mini-chocolate chips. The cookies come out of the oven chewy, soft and sweet. And of course, irresistible! Our friends over at Nuts About Granola are featuring my Hawaiian-inspired granola bars on the new packaging of their Granola Basics and at the same time are giving away 3 copies of my upcoming book, Haute Potato, to their readers. Leave a comment at the bottom of Nuts About Granola Blog post and you might be one of the lucky winners! Yesterday morning I picked a basketful of ripe pears from our garden. I think there are probably about 60 more pears I can gather by the end of the season. Everyday, I give my little baby Aria fresh fruit and vegetables, and at already 10 months old, she clearly adores pears. 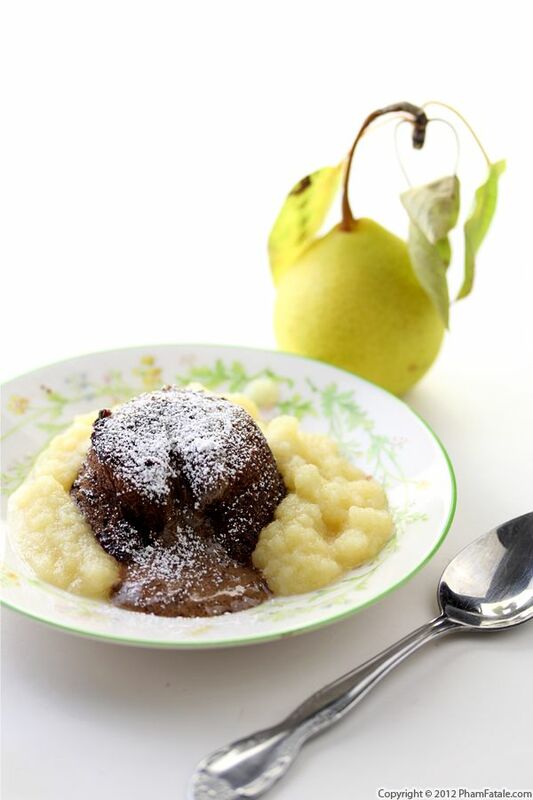 I made a lot of compote de poire ("pear sauce" in English) and after Aria finished her portion, I used the remainder and made chocolate lava cakes. 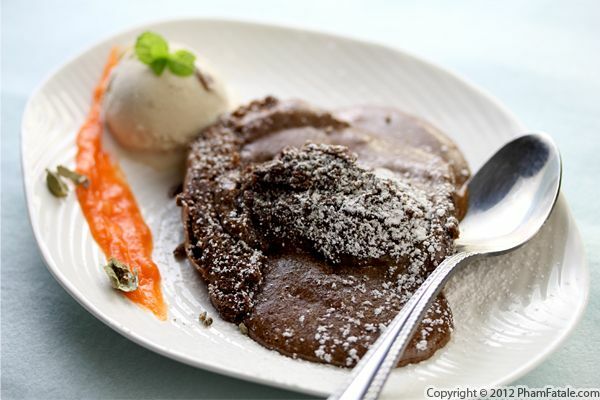 The molten chocolate center paired with chilled pear sauce is absolutely fabulous. If you're looking to impress guests with an elegant chocolate dessert, search no more. I served this dish last evening for our special guest, a monk who came to visit all the way from 'Đà Lạt, Vietnam. He assured me he had never tasted something so good! Page 9 of 16 pages.